Hmm, so I’m supposed to blog and keep people updated. Yeah, that’s not working so well, is it? Well, now Rowan is with Eric. It hasn’t even been two weeks and I miss him so much. For some reason, its much harder leaving him now than it was last winter. Maybe he's bigger and interacts so much more. I miss hearing "Mommy, Mommy, Mommy!!!" when I come home from work. We did a lot here in Texas before I took him home. 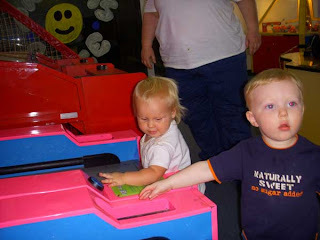 I have some friends from work with kids around the same age and we went out and did a few things. 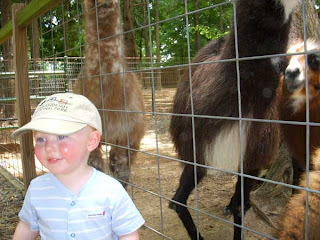 We went to this really cool petting zoo called “Gators and Friends”. 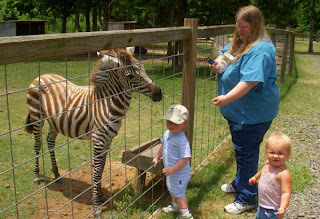 There were so many animals that wanted to be petted. Well, really they just wanted the food that we bought at the entrance. Boy some of those animals are pushy! We went back to Kidstation. That was a lot of fun, but it’s always a battle when we leave. Rowan wants to stay until he collapses, I think. He loves to run around and play with the other kids. Rowan helped Oma in the garden some and loved it when she gave him worms that she dug up. 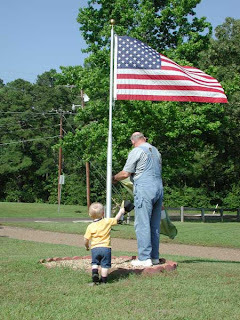 He helps Opa when its time to change the flag. He loves to play in the rain, and thunder is cool, unless it’s right over you. 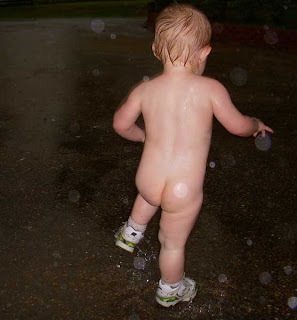 He acts like a sumo wrestler and “stomps” with one foot in the puddles. That’s a lot of fun! 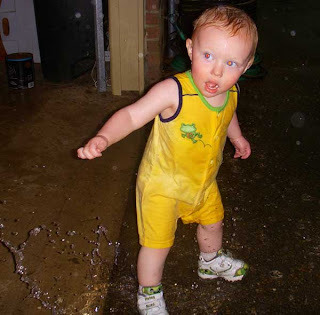 When our clothes are all wet and we’re almost ready to come inside, Mommy takes the clothes off the monkey and lets him “sumo” in the puddles naked. More fun! 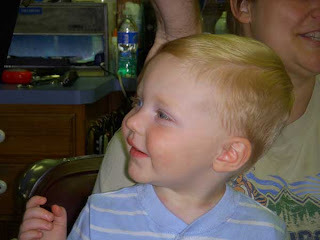 We had our first barber shop haircut. It was very traumatic, but once the barber brought out his toys, Rowan settled down some and let him cut his hair, slowly. 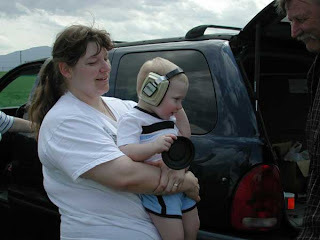 When we were in Virginia, Rowan went to his first shooting range and wore ear protection. He didn’t like the ear covers very much, so he ended going back to the house where it was quieter. He loves his “Mawy Beff” a lot. she gave him a dinosaur and some toys for an early birthday present. Thanks Mary Beth!! He still remembers that you gave him that dinosaur! 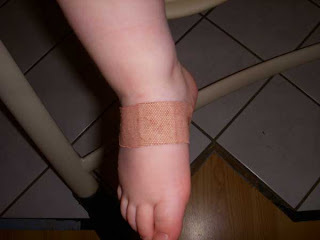 While I was home this last time, Rowan earned his first band-aid. He fell off the couch and onto one of his toys, scraping his foot. I know this does not compare to any of the first injuries of Karen’s three boys, but it’s a first for him. :) When it was time for it to come off, he wanted another one on. I guess it’s time to get some fun band-aids for him. I know this blog is disconnected, its just because I haven’t been on in so long. I'm just trying to get something online for everyone. 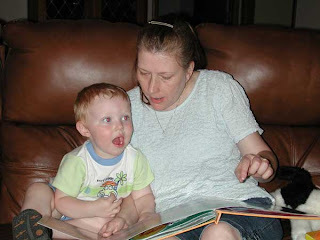 I love reading all my families blogs, and I know they want to hear more from me. I hope to be better at this, but its not something I’ve ever been good at. i love to read your blog too! I know before you even say it that I need a new one too....the summer's just been so busy! 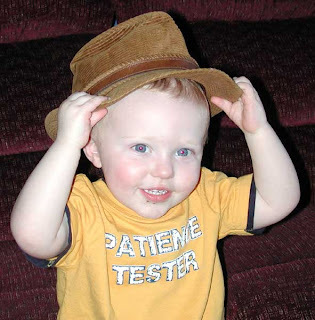 Rowan is even cuter every time I see him on your blog! Hope the loneliness subsides and time passes quickly for you. :o) Love you!